You shouldn’t have any trouble finding this Cafe in the middle of Parramatta Park, but if you were in any doubt, keep your eyes peeled for an enormous congregation of prams! The Parramatta Park Cafe is a huge favourite with local mums and on any given day you’ll find crowds of mothers popping in for lunch with their toddlers, grabbing a quick coffee before continuing to pound the pavement as they circumnavigate the loop of the park, or using it as the perfect mothers group meeting spot. On weekends, it’s a popular place for a family breakfast or lunch and you’ll find not just mums and dads but also grandmas and grandpa’s, aunties, uncles and cousins. For this reason, the cafe always has an overwhelmingly family friendly vibe and it’s a wonderful place to while away the hours. You can sit outside the cafe, at tables shaded by umbrellas and overlooking Parramatta River or indoors when the weather is too hot/cold/wet. Either way, it’s extremely easy to find a spot that suits your family’s needs and prams can fit anywhere you choose. You will also find a number of families who bring their dogs along and they are easily accommodated outside. The cafe also does takeaway if you fancy a picnic or want to keep on the go. My family and I quite often take this option and walk down the slope behind the cafe down to the river where you can sit under the shade of an enormous old tree or continue with our stroll around this most beautiful park. The cafe’s menu caters to almost any palate and there are also a range of dishes for those who have specific requirements such as vegetarian and gluten free meals. For the children, there is a kids’ menu with a selection of meals your kids will love (think everything with chips and a toy!) as well as a few more healthy options like eggs on toast. The kids menu itself is covered with games (like a find-a-word and a maze) which are a brilliant distractions while you wait for the food to be served. 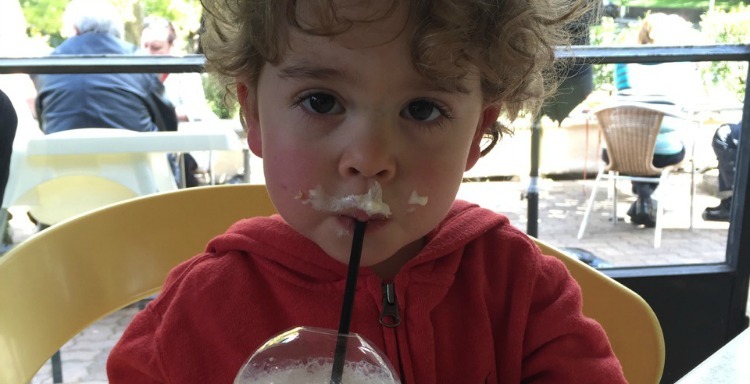 The babycinos and milkshakes come highly recommended by my toddler! While the kids menu is a fabulous option as a treat, the general menu contains a number of items that are perfect for both children and adults alike. The menu features traditional and delicious cafe fare such as sandwiches, pasta, salads burgers and fish and chips. If you are visiting the cafe for morning or afternoon tea, then you will be extremely pleased and are sure to go away feeling more than satisfied. The Parramatta Park Cafe has a fabulous selection of delicacies- cakes, biscuits and, my son’s favourite scones with jam and cream. We are regulars in this cafe for breakfast too and the breakfast menu doesn’t omit any favourites. Whether you enjoy a large savoury fry-up or something a little sweeter and health conscious like bircher mueseli, it’s all there. While I’ve never experienced a problem getting a spot to eat at the cafe, the parking can be at a bit of a premium. Although you may be lucky and get a place right next door, be prepared to walk a little bit. This isn’t generally a problem however since you’ll find the park is the most wonderful place for a walk. Plus, it’s the perfect way to start burning off your wonderful meal!